At the breaking of the seventh seal (Revelation 8:1), John sees seven special angels, each of whom is given a trumpet. After "a silence in heaven" four scourges come upon the world as the first four angels sound their trumpets one by one. earth After the first trumpet sounded, John saw "hail and fire mixed with blood... thrown to the earth" and it destroyed a third of the land and its greenery (Revelation 8:7). sea After the second trumpet sounded, John saw "a mountain burning with fire... thrown into the sea" and it destroyed a third of the sea, its creatures and its ships (Revelation 8:8-9). rivers After the third trumpet sounded, John saw "a great star from heaven fell from heaven burning" and it poisoned a third of the fresh waters in rivers and springs (Revelation 8:10-11). wormwood "The name of the great star was Wormwood" (Revelation 8:11) Wormwood is a bitter herb (Apsinthus), or poisonous plant symbolizing evil (Deuteronomy 29:18, Amos 6:12). lights After the fourth trumpet sounded, John saw "sun...moon...stars...struck" and a third of each was darkened and in a third of each day and a third of each night there was no light (Revelation 8:12). .
a third In these visions, there was a ruin of one third of the dry land, the waters of sea, the waters of the land, and the lights of the sky (Revelation 8:7-12). This was not complete destruction, but it was very bad. Translating this set of visions into real life, we understand that our tribulations in real life can be very damaging, and even fatal. This world is unsafe and uncertain. Bad things happen. We have to believe, nevertheless, that heaven is in control of what happens here on earth, and puts limits upon tribulations and trials. We are vulnerable in this troubled world, so we put our trust and confidence in Christ. These four scourges picture environmental disasters, upon land, seas, fresh waters, and sky. We are very aware of real damage to our environment. Indeed, we might consider it conservative to say that the original creation has been one third ruined. These visions, however, are not portraying an “environmental message”. 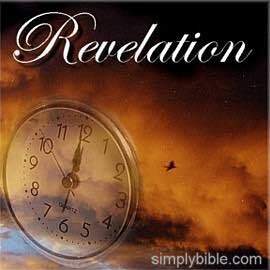 Rather, they are representing the fact that this world is subject to ruin and death and our lives here are but a vapour that appears for a little while and then vanishes away (James 4:13-16). The message of these visions is the teaching of the gospel of Christ that we should endure tribulations and anchor our hopes and our trust in heaven, seeking those things which are above where Christ is seated at the right hand of God (Colossians 3:1-4). eagle [ TRANSITION ] "I heard an eagle flying in midheaven, loudly crying, ‘Woe! Woe! Woe!...’" (Revelation 8:13). This introduces the remaining blasts of the trumpets and three more woes described in chapters 9 to 11. —The first of five lessons on the theme “Anchors in the Storm”. In this lesson, we consider truth as an anchor when we are buffeted by storms of pagan ideas. Tap the title above, next to the arrow, to go to that lesson with a link back to this page. —There are things we all want deep down. At a shallower level, there are things that we think we want but the pursuit of them brings no lasting joy. Jesus knows our real and deepest needs, and he gives accordingly. Here are seven gifts from Jesus. Tap the title above, next to the arrow, to go to that lesson with a link back to this page.